On Saturday June 2, 2007 the stage at Toronto's Premiere Dance Theatre came alive with the ecstasy of one woman named Nalin Bisnath. 250 invitees were privileged with the opportunity to catch a glimpse of the true bliss of Nalin, in the form of dance. She took us on a journey that has been taken only by the devadasi's of another age where dancers surrendered themselves to their Lord by dance. Nalin gave everything she had that night, to her dance. Nalin Bisnath is a veteran of Hari Krishnan's InDance, and has performed as a member of his company all over the world, most recently in the revered halls of Krishna Gana Sabha in Madras, India. She only started dancing in 1999, but watching her dance you would think she has been studying Bharatha Natyam all her life. The chief guest of the evening Dr.B.M. Sundaram a notable expert on the study of Devadasi Culture summed up her performance as that of an experienced professional and not of a dancer giving her debut. Nalin's transition from a fledgling dancer to the mature dancer she now is has been dramatic. During the last 7 months before her performance this young lady originally from Trinidad, immersed herself in learning the Telegu language, and understanding the layers of culture and mythology in the depths of the traditional songs she danced to. The passionate connection to the heroine she portrayed was most evident in her rendition of the Svarajati 'emayaladira'. She brought out the betrayal felt by the heroine as she gently berated her Lord Mallarji for falling for another woman. Her depiction was subtle and emphasized her affection and love for her Lord despite her doubts of his affection. Credit for Nalin's success rightly goes to her wonderful teachers, Hari Krishnan and SriVidya Natarajan. 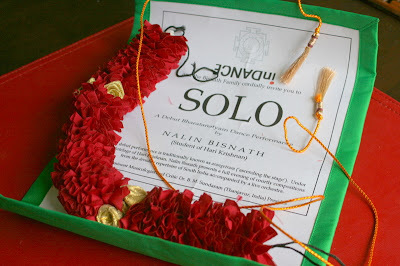 Hari Krishnan has trained and honed Nalin Bisnath, the dancer, with a personal intensity that is unique to their relationship. From taking her to India and guiding her training through one of the few remaining Devadasi's in Tanjore, to being one of her close personal friends and helping her through trials and tribulations of her life Hari has been a guiding force for Nalin and a conduit for her to discover her passion for Bharatha Natyam. (From my experience as one of Hari's company dancers I know he is a consummate teacher and artist.) 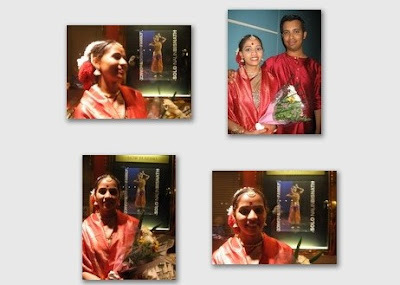 The pinnacle of Nalin's dance education has certainly been the detailed training imparted with care to her by SriVidya Natarajan in abhinaya which has truly ingnited the brilliant flame of Nalin's soul. Her dance was the dance of supreme happiness. The arangetram invitation designed by REX. Beautiful beautiful girl. May god bless Nalin Bisnath with luv, happiness, beauty & much mor for all her life. talent as such is rare ie. divine intervention!